After yesterdays rain the sun has been out all day Sunday. Not quite clear blue skies – there has been the occasional cloud to send a chill back in the air – but not too bad and with it the garden has taken on a different pulse. It needed yesterdays wet to take on another spurt and now the trees are green with leaves . This also means that the beds are thick with weeds and ground elder so a large part of the day has been spent going through them trying to at least clear the worst of them. In between doing that I planted out the nine tomato plants I picked up yesterday afternoon, the three chilli plants and the six geraniums. I also planted out a further set of beetroot seeds as the ones I put into the ground a few weeks ago don’t seem to have taken. s filling with the heady smell of it all. Shortly I will cut up a chicken and cook for another hour. By then then sauce will almost have cooked away and for the last few minutes I will be frying the cooked chicken in the oil that is left over. We must be well into Spring. Thursday evening and there was enough light and heat left over from the day for me to light the small barbeque. The burgers came from the supermarket but they tasted better for being cooked outside. I had mine in a bun with a hot pickled pepper and a good dose of chilli sauce. 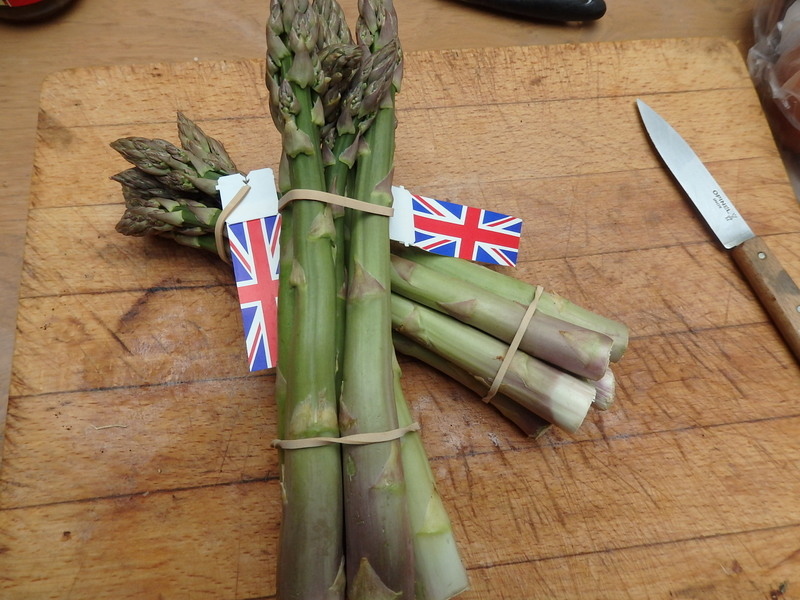 Then this morning I picked up the first of this years asparagus in the grocers. But before that I got tipped upon by a bucketful of rain. I might as well have just jumped into a bath full of water. It came down so thick and heavy in such a short period of time I was soaked to the skin whilst walking a little over an hundred yards and then it was over leaving me dripping with wet. Still dripping I went to the grocers and bought two bunches of thick green British asparagus. Back home I knew that we had some scrag ends in the back of the fridge left over from a pasta dish in the week. A good bowl of asparagus soup only took a few moments to make. An chopped onion and a couple diced potatoes were cooked in butter along with the scrag ends of asparagus and stems of the ones I had bought in the morning. I put the tips to one side. As the onion started to soften I poured in a few pints of water and brought it all to a slow boil. In the meantime I cooked the tips for a couple of minutes and refreshed them in cold water. When the potatoes were cooked I put the soup through the Magimix. As I did that I fried off the asparagus tips in butter. Each bowl of soup was then decorated with a couple of tips. We had it with crusty bread listening to more rain come down. Brighton in the sun and looking out for P.G.Woodhouse. Saturday and the day was spent walking round and watching Brighton do its bit in the sun. To the surprise of some I have not been to Glastonbury but I have an idea of what it looks like and in some respects I suspect that Brighton in the sun is not too far removed from a Glastonbury by the sea. Particularly as it was Record Shop Day and walking down one of the lanes there was a loud band set up playing their music to bemused onlookers and the lengthy queue waiting to get into one of the record shops to try find some rare piece of vinyl. The only difficulty with this being the queue was too long for me to do my own bit of searching for music to add to the collection. Compensation came in the form of largest cache of second hand P.G. Woodhouse I have come across so far. Whenever I am in the vicinity of some second hand books my first instinct to look see what cookbooks there might be and then I move onto the end of the fiction section to see if there are any P.G. Woodhouse. Considering he wrote some 99 books it is surprising how often I come up empty handed. But lurking on the bottom of a shelf in Snooper’s Paradise there was whole row of them. Too many to carry in one go so I had to pick and choose and I still managed to come away with a couple I had already leaving about ten new novels to read. We then had a lunch of crab sandwiches sat near the beach before some us rested on their backs on the pebbles in the sun as I leafed through my purchasers. Just one worrying thought – Nigel Farage is partial to a bit of P.G. Woodouse as well? The house feels deflated again now that we are are a child down back at university but the journey back did give us the opportunity to make a short weekend in Brighton out of it. The weekend started well with me in a pub having come off the train from London with the rest of the family already there and me trying to work out how to make contact with a mobile phone that had died through lack of battery some minutes previous. In some respects it was good to be passed back to those days when the mobile phone was but a large brick carried by a few and the rest of us had to make do with making plans, setting out explicit instructions as to where to meet up and then keeping to them. That was all okay but no plans had been set out and all I knew was that I had arrived and the rest of the family was elsewhere waiting for me to make contact. I spent some time walking up and down streets to see if there were any pay-phones still in existence but once the two or three streets were trod down it became apparent that they weren’t and it occurred to me that their last bastion might be inside a pub. Luckily there was a pub to hand so I made my way in. There was a short pitying look. I was obviously asking about something that had last featured in any pub about 15 years ago. ‘No’ I was told. But then sympathy took over and a question was asked as to whether I was planning on a call to Australia. I was able to deny this and provide half an explanation that the call that was to be made was to go no further than a phone perhaps half a mile away the recipients of which were hoping to meet me. At which, rather to my surprise, the pub phone was put in front of me and I was given free reign. At which point of course I tried to dredge up the odd phone number from Australia that had been awaiting my attention. None came to mind and so the family was called and arrangements made for me to meet with them in the next thirty minutes or so. That thirty minutes left me time to finish my pint and order another and as all was well with the world to ask for a packet of pork scratchings. It occurred to me that the order of the pork scratchings could have been mis-construed but I was able to avoid any further difficulties by keeping my eyes down as I nibbled at the hard bits of pig skin. I then left the pub and spent a happy twenty minutes shovelling coins into a pay phone I found in Brighton Station to try make contact with family so as to check on the arrangements made. It appears that things have moved on from the days when all that a pay-phone required was a handful of 2p coins. You still require a handful of coins but now there is no great guarantee of contact at the other end. No matter I was able to solicit a promise from a nice man at BT they would send me a cheque. Notwithstanding the mishaps with the phone me and the family met up and we had a fine Mexican meal at La Choza in The Lanes. For some of us the third meal that had been had there over the last 18 months and very good it was particularly when the masks came out.